PC version features 64 player multiplayer, high resolution textures, high quality shadows and more PC-specific features. 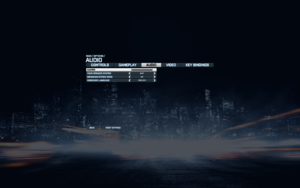 Battlefield 3 on Battlelog - PC section. 9.7 Origin error - "Could not activate"
This command disables the engine's deferred compute shader lighting path. This may give a large FPS boost in open, outdoor areas, but possibly may reduce performance in heavily lit scenes. Most users report only the performance boost, including inside closed areas. This command provides no graphical change. You can create a text file called user.cfg in the installation folder containing this command, so that it's permanently enabled. You may use any configuration with-which you are satisfied. The following tips serve to balance graphical fidelity, function and performance. Setting textures to High may eliminate texture pop-in, if it is happening to you. Setting effects to Low is recommended. Other levels show no particular improvement, it only adds a little bloom around fire sparkles. Settings mesh to Ultra is recommended as it allows you to spot enemies at a greater distance. Set anisotropic filtering to the maximum value your PC can handle. Better AF comes as a minimal (or none) performance cost and significantly improves graphical fidelity. Warning: no official word from EA, proceed at your own risk. meta.xml, PROF_SAVE_body, PROF_SAVE_header and PROF_SAVE_profile are the save files. In-game UI elements will not scale up, but still readable. 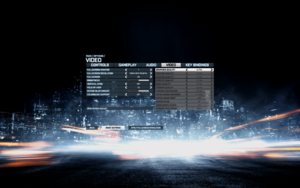 Between 60° and 90°; for higher settings use BF3 Settings Editor or Flawless Widescreen or Widescreen Fixer. Use -noBorder as a shortcut parameter or use BF3 Borderless. Low to High Post AA and 2x or 4x MSAA options. Quick Time Events keys cannot be rebound from the default layout. In-game prompts refer to mouse and keyboard keys. Quick Time Events can only function using a keyboard and mouse. Razer Hydra works with Sixense MotionCreator bundled profile. IndirectSound copied to the game directory can be used to enhance audio quality and spatialization. Consider also enabling enhanced stereo mode in game options. Some regions do not include all languages; see Change game language. 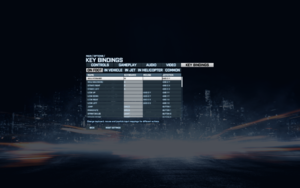 Download the BF3 Language Pack and extract the files to <path-to-game>\Data\Win32\Loc\. 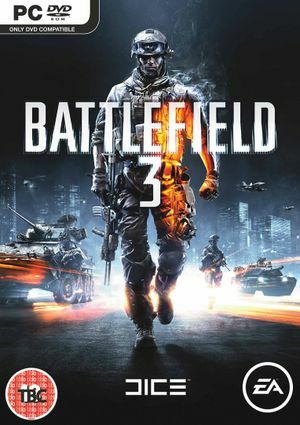 Download the second BF3 Language Pack for the 5 March 2013 patch and extract the files to <path-to-game>\. Replace the circled keys (to the right on this page) with those provided above. Update PunkBuster using the PBSetup utility to fix most issues. Servers must be rented from approved providers. From the main menu, select Replay Missions. Select the mission you would like to continue from. This will overwrite your latest checkpoint. Find a file called PROF_SAVE_body. If its size is 0KB, it is corrupted. Overwrite the file through re-installation or get a replacement from a verified source (friend, reputable website). If prompted by Origin, opt to use your local data instead of the version stored on the cloud. Open the Xonar Audio Center. Turn off Antialiasing Deferred, Vertical Sync and Motion Blur in the options menu. Close overclocking and/or monitoring software such as RivaTuner. In the NVIDIA Control Panel, set Power management mode to Prefer maximum performance. Uninstall TeamViewer and any associated drivers and services. Edit the file PROF_SAVE_profile using Notepad. Save the file, then change its properties to Read only. Launch the game. Go to the Video menu in the options menu. Modify the screen resolution option to a resolution lower than your normal/native resolution. Modify Fullscreen to ON. Apply the changes. Origin error - "Could not activate"
On Processor power management change the maximum cpu usage to 99% instead of 100%. This will disable TurboBoost, which is the reason for weird performance issues in connection with Battlefield 3. ATTENTION: You might also have to turn down minimum CPU usage if it is set to 100% (eg Max performance mode often has this). Also your performance will get steadier with both minimum and maximum settings set to 99%, but at the cost of battery life. You can have these commands run automatically, whenever you start the game, by entering them in user.cfg in the Battlefield 3 installation folder (the file won't exist by default, you can create it through Notepad and save as a .cfg file). This page was last edited on 12 April 2019, at 20:15.